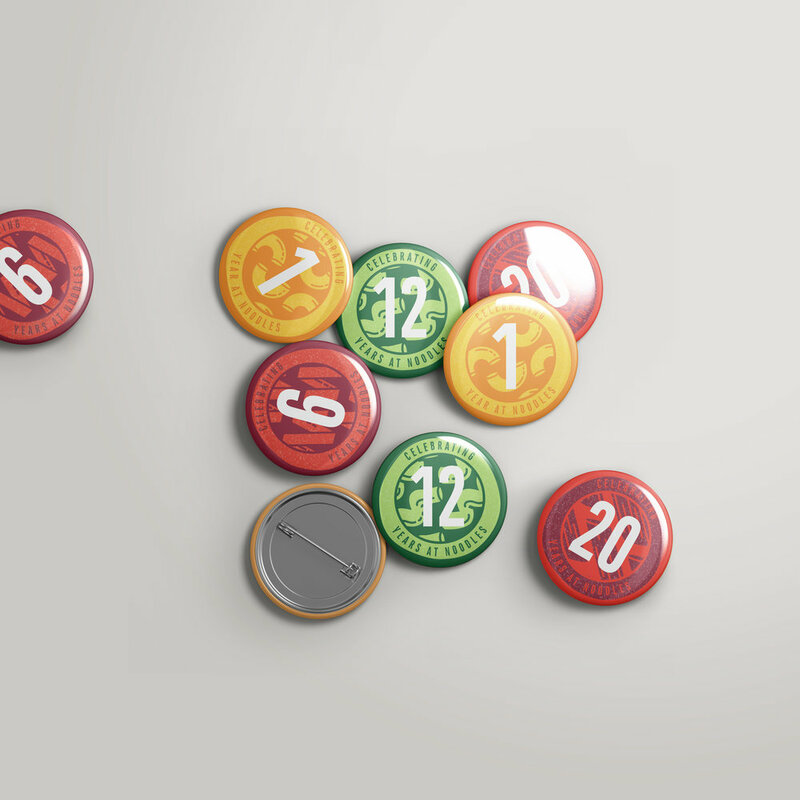 This set of pins is meant as a series to be given out to employees each year of their employment and displayed either on their cubicle wall or on their uniform. I was the lead designer for this project under the direction of the Art Director and Head Designer. When approaching this project I was trying to embrace what I had heard echoed throughout my time at Noodles, “own the noodle.” I wanted to make a series that was not only fun but reflected the Noddles & Co. brand, but also one that would be desirable for anyone to collect in their time at Noodles. Originally the project brief called for the buttons to be stickers to be sized for the name tags of in-restaurant employees, one option being to cover up the bowl icon currently on the tag. I played with the years being intertwined in the icon, but this was rejected for its alteration of the icon. Once covering up the bowl was turned down I went to circular stickers with a 0.5 in diameter to tuck in above the bowl. The majority of the space had to be taken up by the number for readability, but I wanted to play with backgrounds that were still fun and “Noodles” related. Paying attention to the shape I played with the representation of noodle dishes themselves. Noodles has started utilizing illustration more often, so I wanted to see if I could integrate that style into these stickers, but ultimately this was too detailed for the scale. Ultimately it was decided that there was too little room for graphic details, so when presenting the anniversary stickers to the rest of Marketing and HR, so I went for a very simple option, but still brought in details like the organic inner circle and texture. Eventually it was decided that the stickers would be 1 in buttons for both in-restaurant and in-office employees. This allowed for more freedom in design and the use of wording to clarify why the employees had said marker on their uniform or cubicle. Initially I presented a range of options to choose from, utilizing different icons from our style guide to create a visually interesting backdrop. The team favored the use of the noodle pattern, but worried about the clarity of the writing as it was currently presented. I opted for a version where the text had its own band around the circle. I also proposed a set where each of the five years marked a new color and noodle, similar to some of the sticker iterations. While the team liked the division by groups of five, there was not as much love for the blue/gray row which felt too cool next to the other combinations. I ended up using the reverse color way of the mac row to replace the blue. I also added a fill around the noodles which I think helped the graphic push to the back and the number forward. After a presentation to Marketing and HR, there was a request to explore having the colors and noodles alternate every year, considering that the majority of employees leave after 5 years, this way they’d get more than one color way. For this iteration I had to add a darker blue to allow for enough combinations, and used the reverse of the red color way. In the end, though, it was decided to go back to changing color every five years.